Unions are having a hard time in Canada right now. Union density (the percentage of the workforce represented by a union) has stayed relatively constant in Canada over the past few years, but union membership numbers have shrunk dramatically in some parts of the workforce, because of job reductions in highly unionized parts of the private sector (e.g. manufacturing). And although anti-union attitudes in the United States have always been strong, it isn’t unreasonable to think that anti-union sentiment in Canada is stronger now than it has been, shown by such anti-union actions as the proposed revisions to labour legislation in Saskatchewan, and the over-eagerness of the federal government to intervene in labour disputes when a strike might be involved. Within this context, it’s interesting to look at one part of a union campaign around what will likely become a high profile labour dispute. Target, the US mass retailer, will be entering the Canadian market in 2013 by purchasing stores currently operated by Zellers. Target stores in the US are completely non-unionized. Target has indicated that it will hire all new workers for its 100-plus Canadian stores (although it invites current Zellers employees to apply for the jobs) and will not honour the collective agreements at Zellers’ 15 unionized stores – which it might be legally compelled to do under the successorship provisions in most Canadian labour laws. Essentially, successorship requires a business purchasing or taking over the assets and operations of a unionized business, and then continuing to provide the same types of products or services, to continue to be regulated by the terms of any collective agreements in effect at the former business. 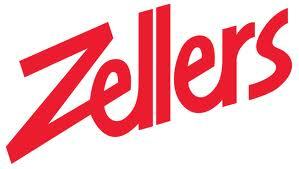 Zellers logo. Credit: Wikimedia Commons/HBC. Nothing in this description is inaccurate – the UFCW is not-for-profit, it’s socially progressive, it works for its members, and it works for improvements in all parts of society. But what’s missing from this description? Hmm…it’s that word that starts with U, ends with N, and has N, I, and O in the middle. I’m curious as to why one of Canada’s largest unions (more than 240,000 members) has chosen not to call itself a union in this blurb. Are anti-union attitudes that strong in Canada that people who might support the Zellers workers would change their minds if a union is involved? Would calling the UFCW a union make the campaign seem less about the Zellers workers and more about the UFCW trying to protect its own interests? I can see the dilemma the UFCW is struggling with. Possible job loss – especially with foreign ownership involved, which has affected recent large-scale strikes and plant closures – is something that most Canadians can surely empathize with, and could be mobilized to complain about. And the u-word might indeed alienate some potential supporters of the Target Fairness campaign; if so, it’s kind of sad that a large and successful union is so worried that it feels it can’t call itself what it is. But when unions are being demonized as greedy, out of touch and unrealistic, this campaign is a great opportunity for the UFCW to show that unions don’t just represent high-paid workers in easy jobs with fat pensions – and to show that unions do a lot more day to day than just yell for more money. 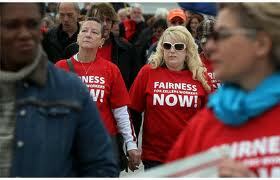 May 5 rally in Windsor, ON, to support the Ask Target For Fairness campaign. Credit: Windsor Star. I’m sure the UFCW carefully considered its Target Fairness campaign strategies, but in my opinion, by choosing not to call itself a union, it’s missing out on a bigger long-term opportunity to build positive images of unions and promote the benefits of unionized representation. Although the unionized Zellers workers are only in 15 out of more than 100 store, at least that representation means that some Zellers workers have a fighting chance to keep their jobs. The UCFW’s decision not to identify itself as a union, unfortunately, is not going to be able to make that point. In the interests of full disclosure, I have to admit that I love going to Target stores in the US, but I hardly ever go to Zellers in Canada. Zellers has had a difficult time competing against other lower cost retailers, and in my opinion Zellers management has made the situation worse through stocking shoddy merchandise and having badly disorganized stores. However, that’s no reason for the unionized Zellers workers to lose their jobs or to have their collective agreement ignored. Much as I enjoy going to Target, I’ll be boycotting their stores in Canada if they try to use their corporate might to bypass their legal and moral obligations to the unionized Zellers workers. The Target Fairness website has a form email letter you can send to Target CEO Gregg Steinhafel if you feel the same way.